Aeronautical objections to wind farms in Germany have increased significantly. This is due to the desire to build more wind farms and to the introduction of more onerous safeguarding requirements by the German national air traffic control authority Deutsche Flugsicherung (DFS). Four gigawatts (GW) of generation has been halted or delayed with particular issues in the Schleswig Holstein region north of Hamburg. The German national wind energy association BWE has a radar working group which considers this issue. 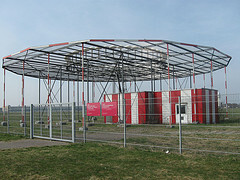 The particular aeronautical installations that prevent some wind developments are airports, radar, ground communications stations and navigational aids. Navigational aids are fixed ground-based radio beacons which pilots tune in to using cockpit instruments. The pilots use these instruments to determine where they are. Navigation aids are still heavily used although the need for them is gradually reducing as Global Positioning System (GPS) based procedures become available. 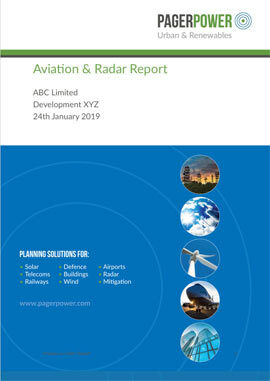 We have been assessing the impact of wind turbines on aeronautical radio and radar systems for over ten years having undertaken work in 34 countries and having worked on 24% of the UK’s current operational wind turbines. Guidance on protecting navigational aids is published by the International Civil Aviation Organisation (ICAO) based in Chicago. Supplementary guidance on buildings near radar stations, radio stations and navigation aids was published by the ICAO European and North Atlantic Office in Paris in 2004 with updated guidance being published in 2009. This European guidance defines a volume of airspace around aeronautical installations where buildings should be assessed to determine whether they have the potential to cause unacceptable interference. The 2009 guidance defined some increased volumes for assessing wind turbine developments. The table below shows the maximum distances (in kilometres) that the assessment volumes extend from the aeronautical installation. It should be noted that the presence of a wind turbine within the distances specified below does not mean there will be an impact. It can be seen that the 2009 guidance extends the wind turbine assessment distances for VHF Omni Range from 3km to 15km and for Direction Finders from 3km to 10km. This change in assessment distance has caused an increase in the number of wind farm objections from DFS in Schleswig-Holstein. A number of objections arise from DFS due to the Michaelsdorf VHF Omni Range (VOR). The VOR transmits a specially encoded signal that enables the pilot of an aircraft to determine its bearing (e.g. 350 degrees) from the VOR. Modern VORs use the Doppler effect to generate their signals and are known as Doppler VHF Omni Range (DVOR). The concern is that wind turbines could interfere with this signal resulting in an incorrect bearing being read at the aircraft. Small bearing errors are acceptable and already occur due to propagation effects; inaccuracies in ground-based equipment; inaccuracies in aircraft equipment and pilot errors in reading instruments. Larger bearing errors are however unacceptable as they result in aircraft navigating away from their intended track. When calculating the likely impact of a wind turbine on VOR performance it is usual to calculate the likely Carrier to Interference ratio (CIR). A scenario is selected (e.g. aircraft at 3000 feet overhead Hamburg Airport) and the strength of the direct signal from the VOR to the aircraft is compared with the strength of a signal that is reflected from the wind turbine. If the relative strength of the reflected signal is high then significant bearing errors may occur. If the relative strength of the reflected signal is low then significant bearing errors are unlikely. The highest levels of interference are predicted to occur when aircraft are flying low near, and beyond, the wind turbine. Our wind turbine DVOR assessments include Carrier to Interference Ratio CIR calculations for specific scenarios to determine the likely impact of a proposed wind development on a DVOR installation. Similar methodologies are employed when assessing Air Ground Air VHF radio systems, Instrument Landing Systems (ILS) and other aeronautical radio systems. The DFS method for calculating the impact of wind turbines has been challenged with alternate studies being submitted to them, suggesting that the DFS calculation method is over-conservative. DFS has in turn had these studies reviewed by Ohio University (USA) and the Ecole National de l’Aviation Civile (France – ENAC) which confirmed measurements taken at Michaelsdorf DVOR but not necessarily the conclusions drawn. DFS continues to employ its current calculation method for wind turbine DVOR interference calculations. Image accreditation: “Not an UFO but a DVOR“ by Karl-Ludwig Poggemann / CC BY.